Kyary Pamyu Pamyu has completed the US, UK and Germany leg of her fourth world tour and is set to finish in Shanghai on July 28. The Halloween themed tour was originally held in Japan last year for which a DVD and Blu-ray was just released on June 27. The singer took part in an entertainment live show at Makuhari Messe at the end of last week titled XFLAG × Kyary Pamyu Pamyu ～Pandora’s Box～. Here’s the full report. This special event was held in collaboration with XFLAG, a video game game developer, and Kyary, who is an official entertainment partner of XFLAG Studios. For many years now Kyary has wanted to collaborate with circus performers, and this event realised that dream. Over 20 world class performers from 11 countries got to work making preparations for over 6 months and came together just for this one day. The performance was themed around Pandora from XFLAG’s video game Monster Strike who took to the stage, together with her box that must not be opened. Clowns on stage take to causing mischief and end up opening the box, initiating the real start of the story. A figure in a black cloak appears from within the box which is revealed to be Kyary who’s wearing a bob-shaped mirror helmet that shone just like a mirror ball, as well as a large parachute-like black skirt. She begins singing her hit song Fashion Monster which fired the crowd up instantly. A performance unfolded behind Kyary of a Russian swing performance which made use of a giant swing. The music and visuals and the movement of the dancing and performers were in complete sync, further sending the crowd into a state of captivation. During her second song, Sai & Co, Kyary took part in the classic ‘sawing a woman in half’ magic trick. Despite being half a Kyary, she continued singing the song which prompted laughs in the crowd from the surprise. 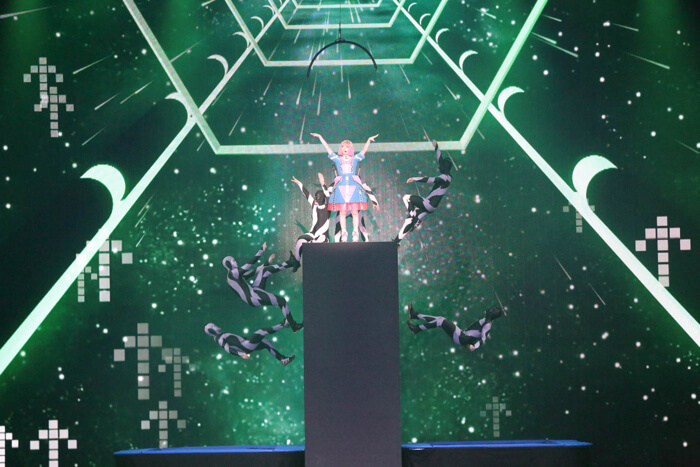 The third song was Invader Invader during which Kyary sang and danced from up high while suspended in midair. She dressed into a colourful new outfit and appeared 8-meters high from the wall. Her performance went hand in hand with the surrounding performers who were jumping from trampolines left and right almost as if they were in zero gravity. She also competed with aerial performers who were soaring around her while in the air as she continued to sing. This was all followed by PONPONPON where performers climbed on top of long and large bendy poles and bent right down to the audience. 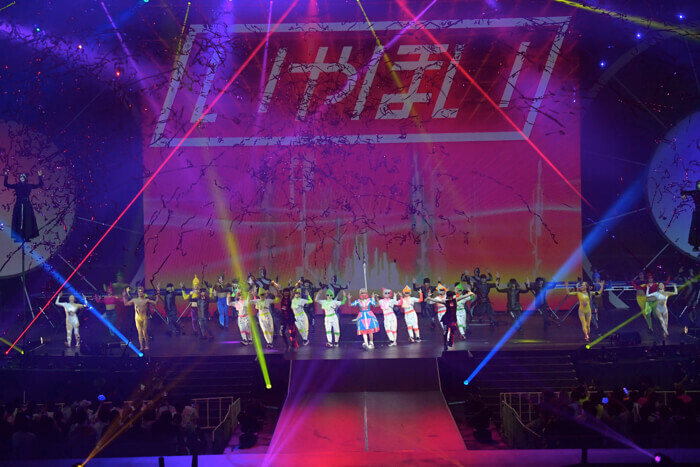 The stage was busy and buzzing like that of a festival: together with the excitement of the crowd, there was the fun stage, lots of dancers and characters from Monster Strike all parading with one another. Song number five was Mottai Night Land. 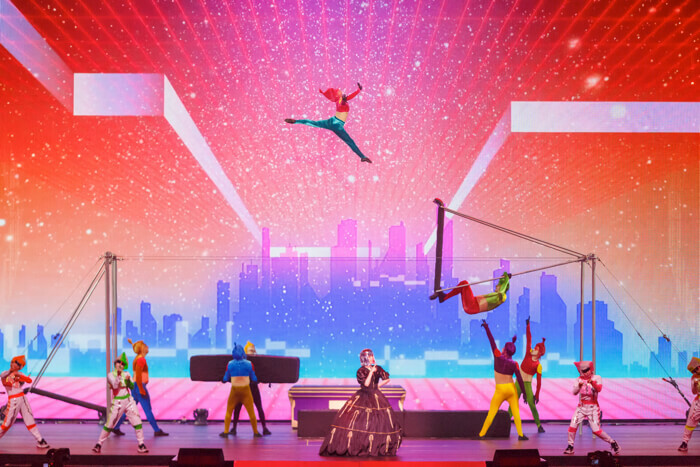 Two male and female performers equipped with aerial straps began to ascend towards Kyary up high, putting on a show that the audience couldn’t avert their eyes from. Harajuku Iyahoi was the final song and saw Kyary perform with fire for the first time ever live. She held a flame in the palm of her hand and a crowd of performers began to emerge from behind her. Kyary used her fire to light their arms aflame. All of the dancers and performers gathered on stage to do the song’s Iyahoi dance. It became a free-style performance with the concert and the circus coming together as one, kicking the show into its climax. It was a fairy-tale ending as huge cheers echoed through the venue. 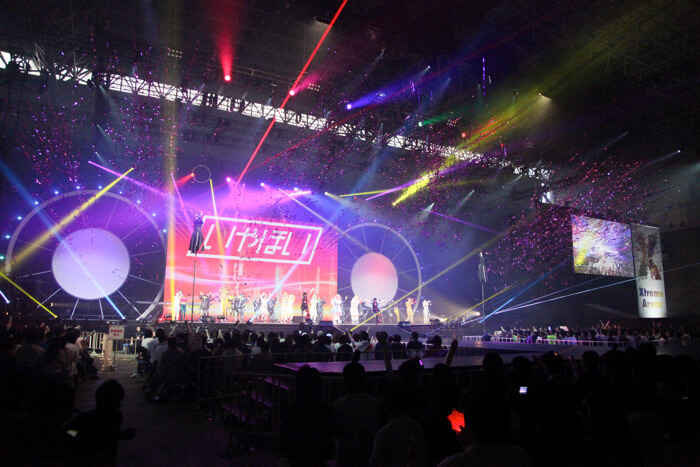 Once the performance had ended, Kyary stood before the 3,000 or so people in the audience and asked, “Did you enjoy the show?” Everyone reacted once more with another huge cheer. Kyary initiated a round of applause for the performers, dancers and characters on stage with whom she was able to create this experience with. Be sure to catch Kyary Pamyu Pamyu on tour in Japan this September. *First press editions come with digipak and special photo booklet. This is Kyary Pamyu Pamyu’s first nationwide hall tour in 1 year and 8 months. She will tour Japan and perform 19 concerts.